Candidate for governor Ben Jealous, surrounded by leaders of the state teachers union, talks to reporters across the street from Matthew Henson Elementary School in Baltimore, one of the schools that had no heat this winter, they said. 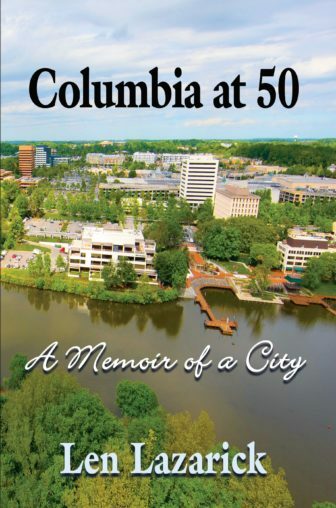 MarylandReporter.com photo. Theresa Mitchell Dudley, president of the Prince George’s Education Association, tells why the union is supporting Jeaslous for governor. MarylandReporter.com photo. Theresa Mitchell Dudley, president of the Prince George’s County teachers union, was standing on a chilly street corner in West Baltimore Tuesday morning, helping to promote the state union’s endorsement of Democrat Ben Jealous for governor that she and her members helped engineer. 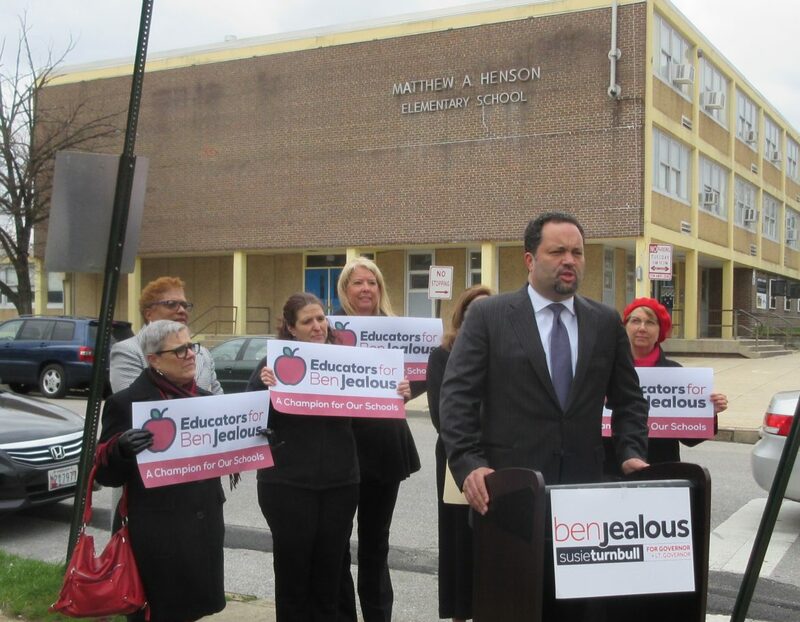 The endorsement of Jealous on Saturday by teachers from across the state was a major boost for him and a firm rejection of Rushern Baker, the Prince George’s county executive who the teachers there detest for multiple reasons — one of the few points of view they share with Republican Gov. Larry Hogan. In an interview, Dudley freely admitted that her local union representing 10,500 educators actively supported the union endorsement of Jealous, the 45-year-old former president of the national NAACP. For months now, the leaders of the 74,000-member Maryland State Education Association have been emphasizing that schools in the state are “underfunded” by $2.9 billion, a figure based on a consulting report finished 15 months ago for the state Department of Education. “We do not have a money problem when it comes to education, we have a priority problem,” Jealous said. He even went so far as to say that Hogan has been underfunding schools by “more than $2.9 billion a year for more than three years,” for a total of $9 billion, even though the consultant’s study came out almost two years after Hogan became governor. The Hogan re-election campaign was quick to respond. Hogan has funded the mandated and most of the discretionary education formulas in all but the first of his four budgets, and the aid has been going up about 2% a year. $1.5 billion more than in Gov. Martin O’Malley’s last term. The Kirwan Commission on Innovation and Excellence on Education has not completed its recommendations for increasing the education aid formulas that are expected to cost at least $2 billion more a year. Asked how he would find the money for the new education funding, Jealous said he would use all the money from the lottery and casino gambling, about $800 million. At the urging of the teachers union, the legislature has put a constitutional amendment on the November ballot that would create a “lockbox,” dedicating all the proceeds of casino gambling to additional education funding, about $500 million. “We’ll stop bloating our criminal justice system,” Jealous said, figuring on some savings there. He complained that the just-passed crime bill backed by Hogan will increase “mass incarceration” with its mandatory minimum sentences for repeat violent offenders. A legislative analysis of the fiscal 2019 budget found that “For the first time since the 1990s, the number of incarcerated individuals is under 20,000,” going down by 391 prisoners last year. The budget for Maryland prisons is $775 million, or about $39,000 per inmate. Jealous estimated it was more like $60,000 per inmate. The endorsement by the teachers is a major boost for Jealous. He has already gained a long list of endorsements from unions and progressive groups, including early backing from Vermont Sen. Bernie Sanders. This puts him ahead of the eight other Democratic candidates in the race. There was some irony in the choice of Matthew Henson Elementary School for the union announcement. The school, named after an African-American Arctic explorer, has a large sign touting state support for improvements and the school has long had the room air conditioners that Gov. Hogan and Comptroller Peter Franchot have been pushing for all schools in the city. But apparently it had no heat in the winter, the union representatives said.